UPDATE 12/18/06: The startup script has been modified slightly (cscript.exe was changed to wscript.exe). Now, console users will no longer encounter a blank black box upon login. UPDATE 11/21/06: Now that banning at the IP level has been added to the script, offending users are completely banned before they can even attempt a second login on Windows 2003 machines. Windows 2000 machines still have a slight delay. UPDATE 1/18/07: I updated the code so that it does not throw out an “unknown” error on line 48 for Win2k users. Thanks to the commenters for figuring that out. Also, check the comments for some really great script modification and ideas posted by blog visitors. Thanks to everyone who has posted! Recently while reviewing my Windows Events, I noticed over 2800 failed login attempts to my Microsoft FTP server. Apparently, a bot was trying to brute force the Administrator password. Thankfully, I soon determined that there were only two IPs I needed to ban. The FTP server needs to be accessed by my employer’s clients so I couldn’t just change the port (as I did when I found 30,000+ SSH login attempts to my Linux box). Thus, I decided to instantly ban any IPs attempting to login as Administrator. I did this using a VBScript file (saved as: C:\Scripts\Startup\banftpips.vbs) that is set to execute upon boot-up. This can be done like so.
' using the NT account "Administrator"
' event viewer "push" that lets it know someone failed FTP authentication.
' should, that there are no legitimate Administrator account FTP logins. strWQL = "Select * from __InstanceCreationEvent where TargetInstance isa 'Win32_NTLogEvent' and TargetInstance.SourceName = 'MSFTPSVC' and TargetInstance.EventCode = 100"
'Iterate through each FTP site. See #2 up above. 'Kill the route to the machine then add it to the array of banned IPs. objDictionary.Add ClientIP, "255.255.255.255" '255 is just there for padding. Note that this bans the IPs on a global FTP level. You will find the banned IPs listed under Windows 2003 @ IIS -> FTP -> Properties and under Windows 2000 @ IIS -> Hostname -> Properties -> FTP Service -> Edit -> Directory Security. This means you will not find it on the properties of the Default FTP Site. This pro-actively bans the IPs from hitting other FTP sites in an IIS setup with multiple FTP sites. In addition, with the new ban at the IP level, the machine can’t even contact your server until your Windows server has been rebooted and the manual routes have thus been reset. Make sure you don’t put this script into the GPO startup. Since it’s a monitoring script that doesn’t end until you kill the process, the machine hangs at “Running startup scripts…” Not too sure what the default time-out is for GPO scripts but it was too long for me. I’m going to update the blog to let others know. Your code helped me write my own script which I now use to curb dictionary attacks. This snippet rocks. Thank you again for sharing. I would like to ask you about an ASP solution that is similar in concept…adding an IP to a specific site where the IIsIPSecuritySetting DenyByDefault is used instead of GrantByDefault. I have a IIS Web Site that is configured to use an Admin account in which NTLM auth is disabled, and an ASP login form where the user/pass is validated against a SQL record (MySQL5) — no NTLM involved period. If the user is validated, I would like the ASP script to add the IP addy dynamicaly to a couple of other web sites hosted on the same server. My WSH/WMI skills are pretty weak to say the least and was hoping maybe if you have time one day you could maybe point me in the right direction….oh hell, who am I kidding…I need code girl, plain and simple, lol. I am not beyond begging, so let me know if there is anything that maybe I could do for you. The only part I have no clue on is the WSH/WMI interaction with IIS to accomplish this specific task. Shouts from the Mississippi Delta! Looks like an excellent script–thank you for posting it! I’d like to get this running on my Windows 2000 server. I’m not familiar with Group Policy objects or startup scripts (other than reading the Windows 2000 help, which isn’t too helpful). Can you suggest how to install the script on a Windows 2000 server so that the script runs asynchronously and doesn’t hang the system on reboot? You are a lifesaver. After logging upwards of 10K attempts at administrator logins from ~12 different IP’s we needed something to combat the inherent stupidity of being locked out of logging into the server as administrator because some other clown(s) was banging away illictly at that server! &gt;how do I tell that it’s actually working? &gt;how can I add this BANIPFTP functionality to a couple other usual suspects (“admin”, “guest”)? Duplicate the section of code starting with ‘Sub EVSINK_OnObjectReady(objObject…’ and sub the desired name? Of couse it’s not a big deal because these logins don’t exist and/or are securely disabled, but would still like to ban the uninvited. You can add it to the startup registry. http://blog.netnerds.net/code/startup.txt lists how to do it though I don’t know if Win2k supports “reg add” if not, just add it using regedit. That’s completely doable. I’ll think about it and get back to you. Since the “instr” doesn’t look for exact matches, “admin” would work for both admin and administrator. To see if its running, go to Task Manager and order by name. Look for Wscript.exe ..if you see that running, it may be this script. To see if it’s working, go to IIS -> FTP -> Properties -> Directory Security. For the record, on ONE of my machines.. there was a delay in IIS enforcing the policy. It took about 4 hours and then hasn’t had a problem since. Weird! EDIT: I took a snapshot of the wrong location. It should be under Windows 2003 @ IIS -> FTP -> Properties and under Windows 2000 @ IIS -> Hostname -> Properties -> FTP Service -> Edit -> Directory Security. This means you will not find it on the properties of the Default FTP Site. You are right about the TheDomain, I changed the object name to be more representative in one place and forgot to change it in the other. I've updated the script. Hey Chrissy, I am experiencing an anomaly I have been unable to solve with the startup method of your script on a server I manage remotely…it works fine on my VMWare instance that I initialy tested the script on, but I logon to it local. I used the “reg add” method you posted, double-checked the paths and NTFS perms, but on the remote server the script does not appear to be running until I login via RDP, and then terminates when I logoff of the remote server…at least it appears to be so…I mean, I tried to login to FTP as Administrator and it never banned my IP addy and I waited for a day as I see in your comment above that sometimes it might take a while for it to appear under Directory Security. The remote server is not part of a domain (workgroup only), and is running 2003SE+all current patches. Ok Chrissy, I can be a little scatter brained sometimes…I was lloking at the Default FTP Site properties instead of the FTP Sites Master Properties…there I found the Denied IP addys I have been testing with. Thanks again for this wonderful script! I had tried the script, but I had encounter some problem after run the seript. So I don’t have any idea what is the error. I copied the sctript to notepad as saved as vbs then ran it on server 2003 sp1 and i get a error. Added…At the end of the script I needed to add ‘End Sub’ on a new last line, line 96. All works GREAT now and initialized as soon as I ran it with a CMD window. As you guessed, this script can manually be run with a command promt minimized (suggested for testing to minimize the restart times). Now the big test will be if these idiot attackers have thier bots set to realize their IP’s are blocked and the attacks stops there. Chrisy: I got hit hard the other day and none of the offending addresses were banned. I made some additions to the words to check similar to what you showed Stevan above, but nothing was checked. Is there anyway to have a whitelist of acceptable userames and everything else gets banned? Something else I was thinking about that could (I think) use part of this code; add those same IPs to the www service ban list, and, perhaps even more importantly, the SMTP Virtual Server Connection Control Deny list(s). Cool script – thanks. It’s added an internal ip to the ban list after logging in from the lan (to test) but I can still connect to the ftp server and get a login prompt which I wasn’t sure should happen. I’m going to try a bit more debugging to see whats going on. I am getting the same access enied error, any thoughts on why? This script is just what I need – thx! Having a problem with it, tho. It seems to be runing (I see the script process), but it doesn’t ban my test IP- even after waiting the “four hours” you observed. Few questions: what format does the log file need to be in? Mine is set for daily using W3C Extended. Also, does it matter if I have added a few ‘deny’ IP’s manualy? I’m running Windows Small Business Server2003 Standard. I’m just wondering if the script is to handle multiple login accounts, e.g. admin and guest, shouldn’t this line be changed too? Whoa, lots of responses! Sorry I haven’t been on the ball, guys.. I’ve been slammed at work and schoool. Right off the top of my head..not sure what the access denied error is about. As for the lag in enforcing the IP ban, someone said rebooting IIS fixed their prob. That’s not a solution, of course..but it may mean I’m missing one finalizing line from my code. I’ll check around it when I can. That was the mysterious “four hours” i spoke of..I probably restarted the service at some point. And Phi, you are totally right. I’ll update my comment to reflect that. Thanks! Very nice script Chrissy, thank you for posting this. Just installed on win2k3 SE SP I with much sucess. Kudos is also due to those who listed the multi username catch mods. Quick question… is there an easy way to supress the cscript.exe window from loading? Everytime I RDS into the server a blank cscript window pops up. Can someone please post the modified version of this line to include multiple login names? I made a few attempts and can’t seem to NOT screw it up. Unfortunately, Chrissy’s script doesn’t work on Windows XP. It contains IIS 5.1, which doesn’t support denying IP addresses (as far, as I know). G … That worked perfectly. Now I get the same behaviour as others have reported which is that the newly banned ips do not take effect immidiately. I verified that they are on the list and when I restart the FTP service they take affect . I just added a script to restart the FTP service every night which seems to work. Well this would be great but my FTP runs on a Win 2K Server. Im not sure this works on 2K. I cant seem to see the process running, and IPs dont seem to be being banned even after the restart of the service. Does anyone know how to use a script to auto restart the FTP service when there is no active connection? objDictionary.Add ClientIP, “255.255.255.255” ‘255 is just there for padding. This line dosnt add the IP to the blocked list… anyone have any idea what can cause this? I am running this on an w2k3 EE SP1 Server with lots of s/w installed. The variable ClientIP contains the correct IP. You are right, that line doesnt add the IP to the blocked list. It just adds it to the dictionary when then adds the IP to the blocked list. objFTPIPSec.IPDeny = objDictionary.Keys is the line that actually does the work. I swear I’ll find the way to add those IPs for good w/o restarting.. I just havent had a chance to look. Worst case, I’ll ask the Scripting Guys. I love the ftp anti-hack script…but let’s take this to the next level. The script currently doesn’t stop them from hammering and generating huge logs, or from trying to hack anything else on the server. How would you modify the script to ban them from even connecting to the server in the first place? I am guessing that the script would need to be changed to add the offending IP address to the denied list in the Routing &#38; Remote Access? Great script! Running it as a service using srvany.exe utility so I don’t have to leave the server logged in. The IP’s aren’t banned unless I restart my FTP server so I put this at the end of the script. Thanks Chrissy. I admire your persistence and will be looking forward to your solution. Clayten, where exactly in th script did you add your “restarting” code? Hey everyone! I used this idea plus a lot of modification to create a windows service which does this and a little more. Let me know what you think! Wouldn’t your stop and start code eject any users that were currently connected to the FTP service? Thx Clayten. That works, but there seems to be a delay in the time it takes the service to restart, sometimes 1-2 minutes. Of course in that time, the newly-detected IP is not banned, and dozens more attempts are allowed. Any idea what may cause the delay?? Anyone get this working with windows 2000? I happens to me as well. Attackers normally get about a dozen or two tries before they are locked out. If I had to take a guess, that 1 or 2 minutes is the time it takes for the Event to get logged to trigger the script (if you do a lot auditing it has to wait in line), processing your entire log file for the day (which could be big), then restarting the ftp servers. If Chrissy can find out how to ban IPs instantly that will solve the delay. Ahhh! You know.. Clayten .. I think I may have just figured out a solution. First, you got me thinking.. IIS Log files take a little bit to write from memory to disk…perhaps that is where the delay comes in? But I wonder if the MSWC.IISLog object can read “unwritten” data. If it does, what I can do is combine Spencer Rupert’s script with mine to temporarily create a bad route to the offending IP address which will stay in effect (I’m guessing until the next reboot) at least until the FTP server catches up. I tried newsgroups for a way to solve that delay but received 0 responses. Perhaps I should get around to writing to David Wang. Till then, I’ll rewrite the script and add that in then email you guys with the new script. Okay, the script has been retooled and it now stops attackers before they can even login a second time. The modifications I made was to figure out the server’s IP address (so that Spencer’s fakeGateway variable wouldnt have to be manually set) then use that to add a route to the IP routing table that instantly kills off the attacker’s packets. While Spencer’s script writes all the IPs to a batch file for permanent banning, I decided to just take my chances and do a “temporary” ban. How temporary? Depends on how often you reboot. So if you go for a year without rebooting, then the bad route will last for a year. So for the record MSWC.IISLog reads data that is still unwritten to disk. This script now works so quickly, that again, I couldn’t even get a second login attempt in when testing. When implementing the new script at work, I also randomly ran into the access denied error that another commenter encountered. Thankfully “G” solved that by suggesting that the the WMI object string change slightly. That worked wonderfully and I’ve modified the original script to reflect the change. I didn’t add the IIS restarter script that Clayten so graciously posted because I didn’t want to chance kicking off legit users. Hopefully the IP level ban will take care of that time delay. Now to figure out the slickest way to get this going each time the computer boots up. The run key works but my coworkers who login to the console always see a black box. Not cool. I figured you’d find a better way and render my restart part moot. :-) Thanks again for the script! Note: Running the script as a service eliminates the black box. Thanks so much for posting this script. We have been getting pounded by login attempts and this has really helped. Your excellent solution is greatly appreciated. OK ignore my question. It works, I was broken. Chrissy YOU ARE MY PERSONAL HERO!!!!! I cannot express in words how unbelievably awesome this script is. YOU ROCK! Takes a lot to impress me.. I’m impressed.. Thanks for this script! I was getting hit everyday with so many unauthorized login attempts that it was avg. 4 attempts every SECOND!!! Not anymore!! Saweeeeeeeeeeeeeeeeet! One problem I had with this script is that if you don’t have a folder called “MSFTPSVC1” in “%WinDir%\System32\LogFiles” you will receive the Object required: ‘WshShell’ error that Gaelan received just above. If you create a dummy folder with that name the script will run without error. If anyone is wondering; If you are testing this script and it does lock your IP address out, you can simply run “route delete ” in a command prompt and you will be allowed again for further testing. Sorry, I forgot to tell you to rename the path in the last part of that .reg file. Clayten, I’m getting a delay on my Windows 2000 machine.. I was all confused thinking the delay was at the IIS end. It is indeed on the Event service end. I don’t really think there’s a way to get around that other than “tailing” the log file forever and that seems to be way more overhead. Perhaps Vista and Longhorn will have some better solutions! I installed the above script on 21/12/06 so I assume this is the latest evolution. (script “retooled” 21/11/06)….unless the above is not the “retooled” version of the script. I have it working fine in winK2 and between 21/12/06 and 02/01/07 it banned some 15 IP’s. The problem remains, however, that the attacks can last up 20+ minutes and all of the “premier attack period” is still reflected in the log …some times as many as 2 per second. The attacker may only get one shot but the “shot” is still lasting quite awhile. Hey Rogue, I tested it on Windows 2003 and the ban is instant but that doesn’t seem to be the case on the Windows 2000 machine I tested on. Not sure at this point how to speed things up. Btw. this script WILL ban IPs on XP. As it turns out, IP banning works in XP programatically — just not in the GUI. Awes! Has anyone tested the script with a FTP site that logs to a SQL DB? We currently log the site to a DB for better reporting. It gets huge from the attacks but that is how the powers that be want to log. This is the perfect script to help me but will it still work with a DB? Thanks for this great script Chrissy! It works like a charm. I’ve got it running on WinXP-SP2 IIS 5.1…flawlessly. It blocks IPs as if the door is slammed! I’ve been looking for a tool like this for ages. Thanks again! Why not just rename the default administrative account “Administrator” to another name?? Louay, for a number of reasons. No administrator account should have a password easy enough for any of this bots to crack. Thus, I’m not concerned about a cracked password. I’m concerned about intense resource usage by thousands of attempted logins per minute as well as the Event Viewer getting so filled up. I am having some problems with it though. I adapted it to ban any IP that used any unknown username (I have a security group that has valid usernames). It works for the first ban, then doesn’t catch events from the even log anymore until I restart it the script. I have been running the script as a scheduled task to run at system startup, but the behavior is exhibited if I run it directly from the shell or from the task scheduler. I guess my post above this one is a bit off. Eventually, the event’s get processed but there is quite a large delay in when they get processed. Awesome, thank you so much, this works perfectly right out of the … uhh… “box”. It stopped 2 attackers within 5 seconds of being launched. I too am having the speed issue… Im running on Windows 2000. It eventually does catch the offending IP address, but not before the attacker has been allowed hundreds or thousands of administrator login attempts. Has anyone resolved the speed issue on W2K? I forgot to mention, I am running Windows 2003 Standard SP1. Still have the delay. Sometimes it’s as short as 5 seconds, sometimes it’s 5 minutes. It has something to do with the timing of that event being generated that triggers the meat of the script. I wonder how we can control that? Thanks a TON for this. I’ve been routinely going through our logs and manually banning IP addresses as they show up. As someone mentioned above, I’ve combined this script with srvany.exe. Just make sure you use CScript.exe to execute it, otherwise you’ll get an error when you try to start the service. This is a step-by-step instruction guide on how to make it run as a service. Thanks again! First , thanks Chrissy for the usefull script. How can i set or is it possible to set multiple log directories ? The event is fired from NON-root FTP site. The result is that it gets the directory for the logs from the wrong site Id. It has removed it from the table, but even then it still appears under directory security tab as denied. Unfortunately, in 2000 Professional the Directory Security table is all grayed out, so I cannot click on the entry and select remove! I’m stock with an IP I don’t want to block. Like an idiot, I tested this out with my home box and now can’t get into my FTP site. :x Any suggestions? this is the incorrect method to do this. it is the correct method. I am sorry but i would rather have it added to IIS where it is easy to manage, rather than using routing. It would have been nice to use IPSec instead for this peice of code. but i created it to go to the MSFTPSVC node in the metabase it works well. afterburn, thanks for the pointer about it firing from a non-root site. When I get a chance, I’ll adjust the script to handle situations with multiple FTP sites or sites with non-standard ftp logging directories. As for the routing, if you don’t want it, you can remove it. The script bans at the IIS level in addition to the routing level. Route banning was added to this script because people were experiencing delays with pure IIS banning. And while IPSec would be nice, it’s also a pain to work with. If you’ve got easy code, please feel free to post. 2. Use scripting to add/remove ips as can be seen here. Thanks for posting the code. I thought you were referring to IPSec at the network level. This looks like IP Security at the IIS level, specifically SMTP. I’m not sure how it relates to banning at the FTP level.. In my script, I used objFTPSVC.IPSecurity to accomplish that. 1-is the new script the one that is published at the top of this blog. if not where is it? 2- i have tried to unban an IP with the script the you listed but it is not working. 3-While there is a banned IP , and has been removed form the security directory of the default site, this ip still can not connect and your script does not list this ip before or after the manual removal. 4- What about the specific times of logging instead of the second time. The script is running on w2k sp4 with IIS 5.0. 2. Not sure why.. but I’ve only tested this on win2k3. As for running it in win2k, I don’t think the script works as well under win2k.. the events are slower to register. Why don't you just download the Windows Server 2003 resource kit from Microsoft? It contains the Command Here utility and installs without any issues in Server 2003. Can someone explain what makes the route added in the code a “Bad Route”? I’ve installed your script as a service (as detailed above). The network level IP block works GREAT. Instantaneous. It’s been HOURS now since my tests, and still no sign of any IPs in the FTP blocked IP listing. I’ve looked at the Global level and the Default website level and… nada. Can you give me a clue what I might do to troubleshoot this? PS…. you’re hot! Your script is hot! If I can get this working right, you’re my HERO forever!!! And you’re my hero right now just for the part that IS working!!!!! Chrissy, thank you for the awesome script! Frijoles, thank you for showing how to add as a service. I’d never tried vbs before yesterday, very cool stuff. Thought I might share the script I whipped up for unbanning. It’ll show you the banned IPs and let you unban single IPs, as I haven’t figured out how to make it ‘purge’ the list… yet. You’re totally welcome! I remember the first time I made a .vbs file and ran it, I was freakin pumped. I knew ASP but never understood how to run VBScript on a workstation as opposed to an IIS Server. Thanks a ton for pasting your code too. Very useful! That has a purge script that may help you. I really don’t know why it works instantly sometimes, within X minutes other times, then X hours other times. Thats one of the reasons I added the ban at the network level. I have a feeling that you’re looking in the wrong spot for the bans. Don’t look at the Default FTP Site-Properties-Directory Security, instead look in the FTP Sites “Folder”-Properties-Directory Security for your banned IPs. My .vbs script (above) will unban single test IPs from FTP Directory Security and the Route List, giving instant access again. Crimson… Nope: I don’t think I’m looking in the wrong spot. I’ve checked the top level FTP Sites FOLDER properties-Directory Security tab too. No banned IPs ever show up. Chrissy: It’s been DAYS, and no IPs have shown up. I can only assume there is something wrong with my install. I’ve done ftp tests numerous times from several different machines. I DO get banned instantaneously. But I never get ANY IPs in the banned IP list. Your script showed NO banned IPs. But there WERE banned IPs for the network because I couldn’t connect from two test machines at all until rebooting. Interestingly… I started taking apart your original script and found that if I remove the network ban code, then the FTP banned IPs show up just fine. But, if I add in the network ban code, the FTP banned IPs do NOT show up. So, there must be something going wrong right there… at least for my machine. Anyway… The FTP banned IP list works instantly for me, so I’ve removed the network ban. This gives me the ability to “manage” the list better than for the network bans. Finally… I’ve added a couple of lines to auto-delete ftp logs older than X days. So.. for now, for what I need, it’s all working like a charm. I’m eternally in your debt. Feel free to call on me anytime for anything. That’s really interesting. Can you do me a favor and add the network banning back /after/ the IIS ban? Let me know if that works? Putting the network ban AFTER the FTP ban works for me. But I did something else at the same time, so I’m not certain which change did the trick…. You use this object to get the FTP log file path. Later you recreate the same WshShell for the network IP ban. Could the re-creation of the object perhaps be the problem. You don’t destroy the previous WshShell object anywhere in your code before this. I removed the 2nd WshShell creation code, and also moved the Set WshShell line to the bottom of the code where you destroy all the other objects. And now… it all seems to be working in harmony! PS… can you possibly give me some guidance for how I would add this IP to existing IPSec settings? I’ve added a list of banned IPs to the IPSec “Security Settings on Local Computer” under a folder I created called “FireWall”. I would MUCH rather add the Banned IPs to this list rather than do the network ban to the route table. I added the following code to email me when an FTP attack occurs. Put it right after the ” WshShell.Run “ROUTE ADD ” &#38; clientIP &#38; ” MASK 255.255.255.255 ” &#38; serverIP, 1, True” statement. Bob – Thanks for the heads-up on the email bug. Because the “bad route” step doesn’t seem to work for me, I was greeted by 30,000 emails this morning! You are awesome!! Thank you so much for script. It worked like a charm. Stellar! Trying it out now. I just installed this and it’s not banning (2003 sp2). I’m getting the Object required: ‘WshShell’ error. I saw that someone suggested creating a MSFTPSVC1 directory to fix the error, but I already have that directory. Are there any permissions I might be missing? Tim’s solution looked interesting, but I didn’t quite understand what his final file looked like – Tim, if you’re there – can you post? The script is great but I have run into a problem where not all of my FTP sites follow the msftpsvc naming. I could create a script for each FTP site that is in a sub directory of logfiles but that would be to hard on the system. Will there be an update that will loop through the logfiles directory pulling logs for each subdirectory? Hope this question makes sense. Thanks tons for writing this, and thanks tons for answering my emails so helpfully! Tons of thanks to Chrissy! I’ve posted my current solution on our website (I can’t seem to get this site to accept my code without cutting it short). See it at http://www.vizimetrics.com (Ban FTP Logins). Sorry – I’m trying to understand this code and … why, exactly, does the code to add the client’s ip to the routing table (as the destination) with the server’s ip as the gateway result in the client being unable to connect to the server via TCP? I thought you could use the routing table to block access TO a destination, not FROM a client. And, is the serverIP supposed to be an unused address in the local network, or my actual server IP (which wouldn’t seem to work). Thanks a million, and thanks for posting this code in the first place. Strange this is one of the few websites I could find on the internet that addresses this problem at all and Ive done all kinds of searches. Thanks to the ideas on this site, I got the idea to block the ips on our cisco firewall. so I could vbscript a telnet session. Instead of creating an event alert, I used a scheduled tasked to check the last log every couple of minutes. The alert does stop the hacker faster though. I used a 2nd script to clear the blocked ips once a day since our hackers seem to use a different ip everyday. The nice thing about blocking at the firewall is it completely stlops the IP from doing anything, including FTP. Cisco firewalls have a shun command that does this, and I would think most other firewalls have a similar command. ‘re-open the bannedips list so we can possibly add to it. ‘open the log file and see if anyone is hacking us, test to see if someone is logging in as administrator, test, or root. Thanks, Chrissy, for a brilliant script – and to frijoles for the instructions on running it as a service. You guys rock! I’ve been playing with a version that defends agains brute-force attacks direct on the server, too (not just via FTP) and thought some of you may be interested. The reason I started doing this is that – by the time I found this page – I’d already solved the FTP problem by installing the free (and secure) zFTP Server from http://www.zftpserver.com. This has a feature which can block IPs of reapeat bad logins, so the problem went away. However, I was still left with the problem of people trying to hack in directly via RDC; the logs (emailed out via EventSentry) show that my server had been the target of sporadic bursts of rapid-fire password guesses, for example 60 attempts in 4 seconds and, on another occasion, 800 attempts in 18 minutes. To try to deter this kind of rapid-fire brute force attack, the script I’ve developed — based heavily on Chrissie’s — detects the IP address from the Windows Event Log and then blocks the offending IP for a user-definable period (defaulting to 10 seconds), after which the block is released. The advantage of this is that brute-force attempts would be discouraged, but people sitting being a firewall or public proxy wouldn’t be locked out of a website simply because an offending machine was using the same gateway, they’d just get a delay in seeing the web page (or perhaps have to try again in a little while). Thanks again to Chrissie for getting the ball rolling and being (I think) the first (only?) person on the net to tackle this problem! ‘ This script has only been tested on Windows Server 2003. Hi, I tried running the script at the top of the page, on Win2003 SE tried invalid admin login via FTP and it blocked me on second attempt – ok – however my IP is completly blocked from the server I cant access websites or RDC – is this correct or should it jsut block FTP – or is there something that I need to change to just block FTP? Chrissy.. you are a GOD!!!!! Installed the script a last week and today it did its job! Running Win2k Server and it caught and stopped a Brute Force attack in 10 seconds(8 attempts). Chrissy’s – Your’s parses through the entire log file at every event. The “route add client mask fakeIP” just reroutes back to the server, which does nothing (or at least thats what happened for me). David’s – I liked your setup, but you only banned using the routing table, and not within IIS too. I had to learn vbs as I went, so it took me a little longer than it should have. I am used to C/C++/Java/PHP/etc.. I also added some features. I hope you like it, and thanks again! Thanks Martin! The other script wasn’t working for me on my 2003 server. I’ll give yours a try. I get hit every day from several locations so I should know pretty quickly if it works smoothly and will report back. Though I tried to use your skript, it does not work the way I like (ban IPs regardless of username). So I simply wrote my own. It takes use of LogParser and has to be scheduled as task. Well, those scripts will make sure that no matter how many times they try, the brute force robot will never get in, but your server will still respond to every request for hours on end using precious resources and bandwidth. I’ve written a small application in .NET that will stop your server from responding completely. You’ll see a few entries in your logs, but once the app sees the attack those entries will cease from that IP. It works for me, but I would need to add some additional configuration options if I were to distribute it. So, that being said, would anyone here pay 3-5 bucks for something that would solve this problem once and for all? Also let me know if you’d prefer a windows service over a desktop application though I’ll probably write both and give you guys a choice. Please reply in this thread or contact me. I would definitely pay 3-5 bucks for something that would solve this problem once and for all! Complete life saver! The script installed as a service works wonderfully and is as close to damn it instant. Very impressed and some great vbs code. The zip file contains the original vbs from this site. Really struggled to find a copy of it – so thought I’d share. Really teasing to see the happy comments but not know what they are talking about! In response to someone asking about the logging type – yes you need to change it to Microsoft IIS Log File Format to get it to work. I was puzzled for a while but changing that and it all sprung into life. Again thanks Chrissy – great work. I would suggest logging to an sql db and add triggers on the table, looking for insert action. Checking the servicestatus field should get u there. Thanks Chrissy 4 a great site and reading! Those wanting Crissy to run for President of the US say I! Thanks for this code, found it very usefull. For a server running win2k, I found that setting the gateway to the server IP address did not block routing. I had to set it to an unused IP address on the local subnet of the server. Also, on the command line, the metric keyword and value are required, so I added it to the script. With Win2k, I am showing the ip address as denied in the Directory Security properties, however, if I clear the bad route, the ip address is still allowed to connect. I guess this is the lag issue that was mentioned regarding win2k. Regardless, the IP route ban accomplishes the necessary goal. Just a followup. I was incorrect in assuming setting the gateway to the server IP address did not block routing. I was testing from a computer on the local subnet. It seems that this blog/site is still the authority when it comes to searching for blocking failed attempts via FTP. Great Job Chrissy. One snag i’ve encountered and would appreciate any guidance. I understand its purpose but the “Set IPConfigSet = GetObject…..” throws up an “Error: Unspecified Error” and “.ExecQuery” entry returns “Error: Not a Collection”. Is it too much to process or am i missing something else here? Sorry for the double post. Havefun’s problem seemed to be the same error we were experiencing and once i added the extra slash it fixed the scripting error. Hey poplou, I think the slash may have fallen off when I migrated the posts. I’ve updated the code, thanks for writing! Also to everyone else with questions..sorry, I no longer have time to test but be sure to check out the comments, a lot of smart people have great ideas! Where can I get the latest code for this FTP screener? We too have an FTP site that gets hammered every night and i want to implement an IP ban solution but I didn’t see a clear “Download latest” anywhere on the site here. Thanks to all for this great utility. I can’t wait to implement it. I have this script installed and set to run through the HKLM key as it should be. I’ve added a task scheduler to run the script with my credentials (I have admin access to the machine) at startup but it won’t start until I log in and as soon as I log off, wscript.exe stops running. I am running pslist remotely to the server to confirm that it starts when I am logged in and then stops when I log out. Is there something I am missing? Server 2003 Standard latest and greatest Windows Updates are all installed. I installed the script on one of our servers which runs multiple sites. script will bail out on the 2nd loop. It works as expected after my modification. Chrissy, Gang, this is all too cool and appreciated. I got it all installed, running and updated for some more names. I seem to get a lot of hits trying to login as ‘test’. Let me note that after all of that it seems that this issue has caught the attention of the gang in Redmond. I found that they have developed an IIS add-on to address the same issues. Oh well, I needed to brush up on my scripting anyway! Keep up the good fight, what you have done is bring attention to an issue the big guys should have taken care of two years ago. how to correct it? thank u. Has anyone successfully deployed this script on Server 2008? I too have the same issue with the script seemingly taking a long time to kick in and am on Windows 2003. I’ve just had an automated dictionary attempt on the administrator account. I can see in the event log that there were 71,088 attempts in about 18 minutes. The attack may well have been going on for longer but the event log reached it’s maximum log size so these will have been lost. It works fine when I test it by attempting to login from an FTP client though. I wonder if it is the sheer number of attempts that overwhelms it? ‘Iterate through each FTP site. See #2 up above. Nice script, but it has an issue: Everytime a login-request is send, the script takes resources. It even starts running if the IP is already blocked. This results to the issue, my CPU is at nearly 100% when someone tries to login as “Administrator”. Does anyone know if there is a way to mod the code to allow certain IP addresses? A couple of our web apps end up getting blocked internally when users fail to enter the password correctly. They aren’t even using the admin username but I take it the connection string is calling on it somehow. can you help with this Prob…? Thanks for so much help!!! The script doesn’t seem to work with Windows Server 2008. Has anyone got it running on Windows 2008? Is there a way to list the address’ that have been placed in the BAN ..?? and then an UNBAN method..?? It seems the scripts worked for you. On my windows 2003 server is not running, it gives me the error I am getting error on line 150, saying path not found. @Isprin: This script adds the ban directly into your IIS settings. Just go to IIS administrator to manage the IP bans. Thank you very much for this execellent script. It runs without modifications om my Windows Server 2003. Copy the script into c:ScriptsStartup folder. 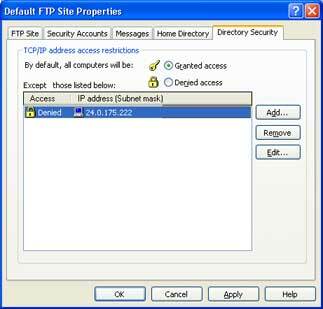 Then check FTP logging is enabled on both the master FTP properties and the FTP server. In logfiles system32logfiles there should be two folders Logfiles (usually empty) and MSFTPSVC1 containing FTP logs. Do not name the log directories in IIS properties, the server will automatically create them. Leave it as %windir%system32logfiles for both. This is important so the script can find the logfiles. Then go to regedit and find the key for LM software microsoft current version run and make a new string value – call it banftpip and add the path to run wscript or cscript .exe and then the path to the vbs file scriptsstartupbanftpips.vbs. This is an example : c:winntsystem32wscript.exe C:scriptsstartupbanftpips.vbs You may have to change winnt to windows on some servers. Also if the script is the old version change wscript to cscript or change the instances in the script to wscript from cscript. Then reboot the server and the script will execute on startup. To verify it is running use taskmanager and wscript or cscript should then show as a process. Because the script only bans Administrator logins, check logfiles for the first username in an attempt and make a second script replacing Administrator (in two places) with the new user name and call this script banftpips1 and make a new registry key of the same name banftpips1 to also start that script. Common hacks use admin, abby, test, administrador and so on, make a script and registry entry for each one. Reboot and now each script will catch each new name and ban it – once the first attempt is stopped the hacker cannot then try additional names as his ip will not connect. Great script Crissy. The 'like so' link to setup instructions are broken – just wanted to let you know. I'm very sorry to go against all these nice comments but I personally think this script is *no good* for one simple reason: you must restart FTP service to make the BAN effective… (well, that's what happens on my two W2K3 boxes). Although the banned IP are listed in the "Directory Security" of IIS and are also propagated in all the sublevels… you are forced to restart FTP. Now, on a production machine with 100 users there's no way I can restart the service after every ban. I could restart the service during the night… but this way the BAN simply doesn't work!!! And I get my LOG FULL OF Events 529 & Co.; I can get something like 1,2 million in a day. Where %1 is the parameter the VBS passes to the BATCH. What you need is an IPSEC policy active (yes, talking about standalone servers, no AD) where both the Policy has "BlockIP" name. And that works in real time, no restarts and no delay… only the time for IIS to flush the log buffer. Bye, and thanks for the script, it's good a part from the fact it's not suitable for me! That takes effect immediately (until reboot) and the FTP ban keeps it permanent. Hello. I ran this on a Windows 2008 R2 Standard server. I tested logging in as Admin got my IP blocked. When looking through the IIS settings, I cannot find an entry where my IP is in order to unblock it. Can anyone help? Thanks. Yeah, I’m in the same boat as MVA. Ran this, it’s setup as a service, running on the system account. It worked, in the sense that I had someone try administrator via cmd > ftp domain.com They were blocked. I checked everywhere, and the IP was not listed. I checked cmd > route print, and i saw his ip in the table, but it was not anywhere in the directory security under the ‘FTP Sites’, or any virtual site. Then the banftpview, only shows the IP ranges I entered manually. Windows Server 2003 SE SP2. Also, whats happening in the route table. How is this working? trying to understand this better. I read alllllll the comments, i feel like a tard, cause this is so old too. Uhm, I had quite a few problems with the script because maybe because my log file is very big. If I remember well I had [email protected]% problems, too. 3 Pings/Trackbacks for "IIS: Instantly Ban IPs Attempting to Login to MS-FTP as Administrator"